Many professionals depend on Microsoft Outlook for their work and stores their emails, appointments, contacts, notes, journals, etc. PST file which saves all your information in Outlook email client, has the location of their own in different versions of Outlook. By default, PST file is stored at “C:\Users\ \AppData\Local\MicrosoftOutlook” under Windows 7 or Vista and at: C:\Documents and Settings\ \Local Settings\Application Data\Microsoft\Outlook\ under Windows XP. Office 365 – Office 365 is a cloud-based email application that can be accessed on any devices. Microsoft Office 365 suite of the application includes several different online services including Office Professional Plus, Exchange online etc. No need to install Office 365 in your system. The only thing you need is good internet connectivity. What are the reasons for moving Outlook files to Office 365 account? In Outlook, you need to install it in your system but Office 365 is a cloud-based email client that doesn’t require installation. The only thing you need is good internet connectivity. Office 365 account provides 1 TB of cloud storage per user so you can get plenty of spaces for all your files. Sorting out software licenses is a big headache but in Office 365, there is no such headache. There are full data security and control. You always know where your data is and who has access to it. Even in case of mobile device theft, you can remotely wipe all data. How to import Outlook files into Office 365 profile? As manual method steps are given above but they are too confusing. Moreover, Outlook and Office 365 profile need to be opened for conversion of Outlook files into Office 365 account. To overcome these issues, Softaken PST to Office 365 Migration tool is introduced by the developers. The software simply imports all Outlook files systematically into Office 365 account without any file loss and damage. Unlimited Outlook files are converted one by one by the software. How the software works for importing Outlook files into Office 365 account? The software has only working of three steps for conversion of Outlook files into Office 365 account so that any user can simply perform the task without any hurdles. Step 1. Browse required Outlook file – The first step is to locate the required Outlook file for import into Office 365 account using Browse button. Step 2. 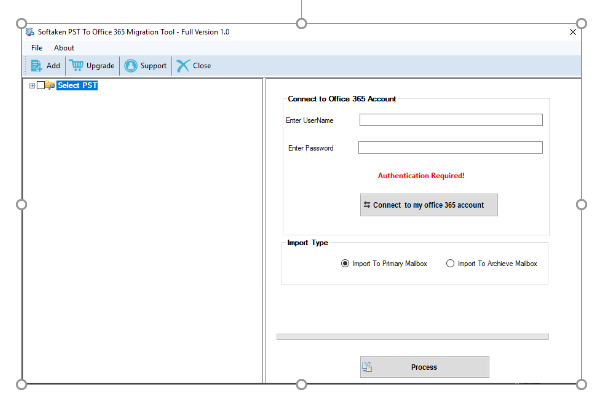 Provide username and password of Office 365 account – The next step is to provide username and password of Office 365 account in which you want to import Outlook files. Once the software gets right login details, it will authenticate successfully. Step 3. Select import type – The last step is selection of import type to save the end results. You can use primary or archive mailbox import option as per your wish. Primary mailbox – This will import your PST folders to Office 365 matched folders like PST inbox to Office 365 inbox, PST drafts to Office 365 drafts folder etc. 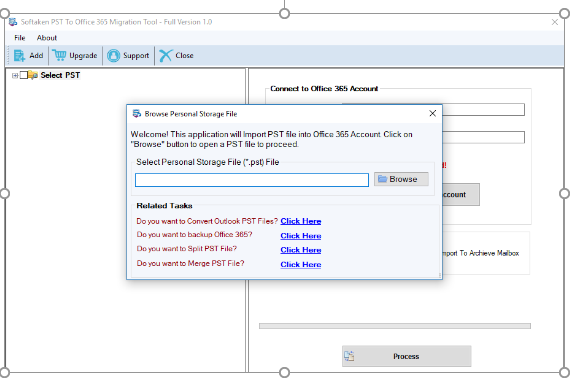 Archive Mailbox – This option will create a new folder to Office 365 account to save your PST folders such as inbox folder is newly created to Office 365 account to save PST inbox data.